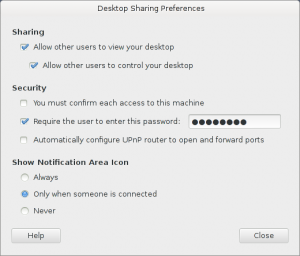 In Gnome 3 there’s an option available to activate desktop sharing, which behind the dialog is just a VNC server. 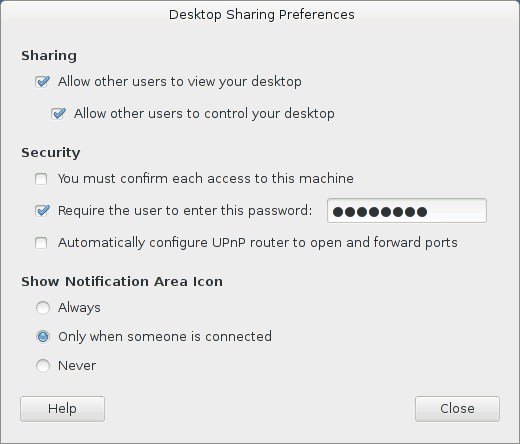 This option can be found under System Tools -> Preferences -> Desktop Sharing. In the dialog itself you can allow viewing and/or controlling of the desktop. Unfortunately I encountered a problem while connected. The arrow keys where behaving different, the up en down key maximized or minimized the window. After a little search and some attempts to fix this behaviour, I found out the keys did behave as expected when I hit the super (Windows) key at the same time. That was the key for solving this issue.